I look at the empty entrance of the owl box and feel only sadness, mostly for the male owl. There is still time for him to find another mate, but disappointment weights on me right now. I have not heard him during the night and can’t find him roosting in the wax leaf ligustrums. I wish I knew where he went during the day. I should have sat on the deck last night and waited for him, watched to see if he hunted in the yard. All around the neighborhood there are signs of spring: Irises popping up, redbuds in full bloom, the amaryllis growing straight up at the corner of the house. Even the salvia is blooming. 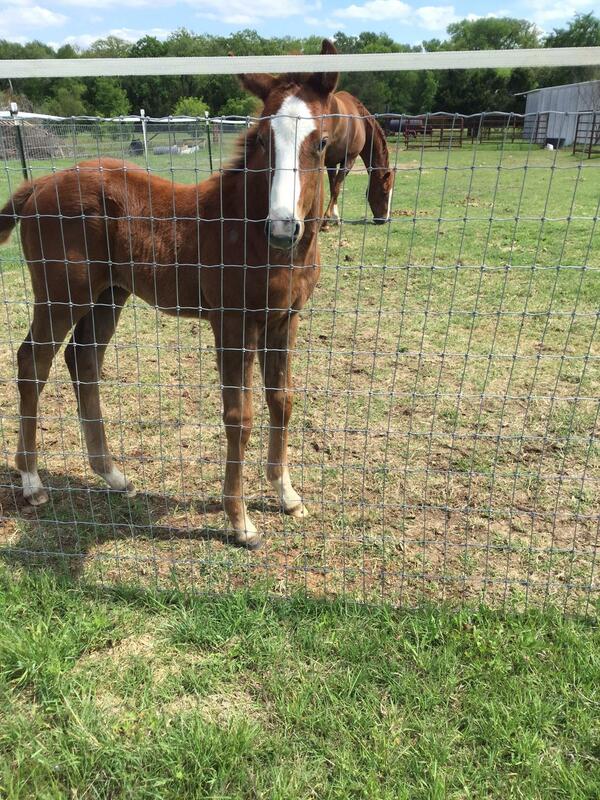 Stacie has a new baby at the barn, Vi’s little foal, a boy. He is a handsome chestnut with a white blaze and white socks. A feisty young thing, he kicks at Vi while trying to nurse. 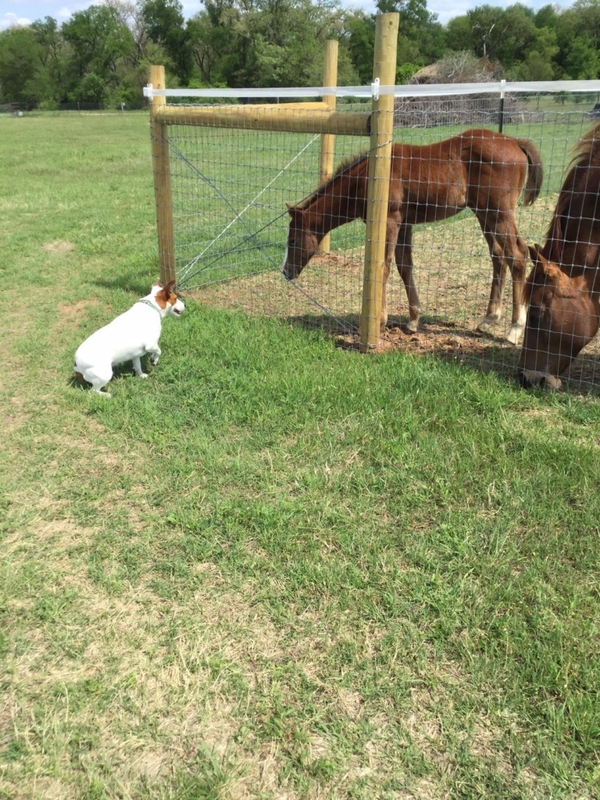 Brownie’s black filly gets friendlier each day. She comes up t the gate at the round pen and bends her head to sniff at Daisy before her mother trots over. She even nuzzled Willis who stood there wide eyed in surprise. February 28: Owl feathers found scattered in leaves at northwest corner of yard behind compost bin. Male owl is still in box. March 1: Male is not in box in a.m. or p.m.
March 2: Male is back in box. March 4: I hear a screech owl whinny outside my office window around 8 p.m. Owl is not in box in a.m.
March 6: Tim’s owl appears to be a female, fluttering her wings and displaying nesting behavior. March 12: Tim’s owl lays first egg. March 13: Owl calls all night outside bedroom window. March 14: Tm’s owl lays second egg. We watch! It occurs about 7/45-8:00 p.m. We watch male feed the female several times. The redbud is beginning to leaf out. The amaryllis is budding and the crocus s sprouting. I almost pulled it out when I was weeding. The yellow bells are growing back, but the Pride of Barbados remains dormant. It has been a lovely pre-spring week with temperatures rising from 50 to 70s and even 80s. Along 290 bluebonnets are spreading patches of blue along the highway. There is a thick bunch on the corner of Karen and Yates that seems to have sprung up overnight. Near Lockwood Springs Road Indian Paintbrush bloom. Bradford Pears, my fontinia, Mexican plums – all this spring beauty while the Northeast is slammed once more with another vicious storm. It is still winter there. The male owl has not found another mate yet. It pains me to even thing of it and I don’t want to write about it. His mate’s feathers remain in the far corner of the yard, scattered among the dry leaves, a memorial t her little self. Perhaps I should save one or two, or bury them, but it just doesn’t seem right. She was happy outside in the trees. I keep saying I’ll wait outside one night around 8 when it begins to get dark. I want to see if he returns to the yard to hunt or for water. It would make me feel better if I could just see him. March 19, 2918: Tim’s owl has four eggs. March 20, 2018: My owl box is still empty, though I hear the owls in the early, early morning from the bedroom. March 21, 2018: My owl box is still empty. I thought I heard the owls this morning. When I stepped outside in the early morning darkness and cold, there is only the hum ad whine of distant traffic. They must be there somewhere in the ligustrums and hackberry trees. The goldfinches have disappeared too. The three that showed up to pick the thistle from the socks must have been American goldfinches migrating through to nesting grounds. Instead, in the middle of the day I find a squirrel hanging upside down on the sock. The sunflower seed seems to be going down faster and more completely. Grackles, blue jays, cardinals, sparrows, woodpeckers, titmice, chickadees and house finches all take part, but lately it’s the big birds, like grackles, who reach in with their longer beaks and grab seed from the bottom opening and the floor of the tray. One night I will open the gate to the backyard as Daisy and I return from a walk and catch an owl sitting in one of the bird baths or on the walnut tree or a shepherd’s hook. They will bend their rounded head, searching the ground for bugs while Daisy and I watch quietly, until the owl flies away. A fine drizzle sifts through the air. We need a good soaking rain to push lagging flowers to the surface and refresh our lawns, but April is just around the corner. The rain will come. In the meantime, the sprinkler gyrates back and forth, watering the grass and sage which has begun to bloom, its tiny white flowers sprinkled over muted green leaves. I sit outside enjoying an early spring morning while I still have this place. A blue jay and woodpecker steal sunflower seeds from the feeder. Occasionally a squirrel hangs upside down on the feed or even on a thistle sock. There is now only one sock, the other chewed off the shepherd’s hook. The three migrant gold finches have flown on, so the sock just hangs there, waiting. What a different year this is from a decade ago. The wildflowers along 290 and Blake Manor spread across pastures. Bluebonnets and Indian paintbrush color the fields in a blanket of blue and coral. 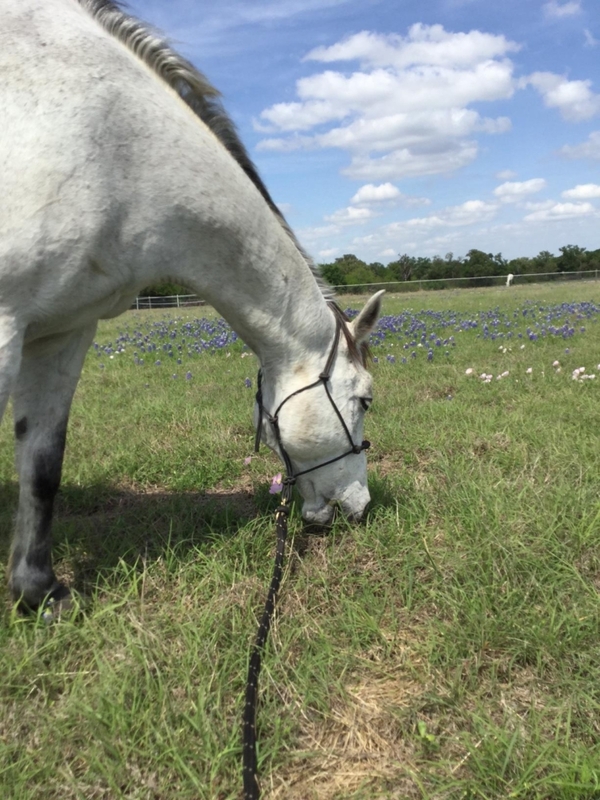 In the fields behind the barns and turnouts at Scattered Oaks, patches of bluebonnets spread through tall grass. The two foals play together. They come to the fence with their mothers when Willis and I walk by, maybe curious, or maybe as a warning to stay away.